Send Treat with Bournville to Chennai. Gifts to Chennai. Send Chocolates to Chennai. 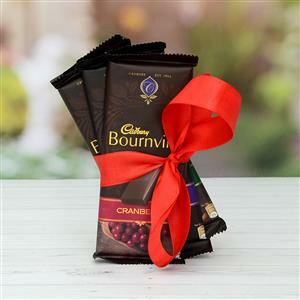 Description : This delicious chocolate hamper consists of three dark chocolate bars from Bournville with varied flavors of Rich Cocoa Chocolate 80g, Cranberry 80g and Raisin Nut 80g. You can send this delectable chocolate hamper to your loved ones in Chennai and make the occasion even more exotic. Other Gifts to Chennai can also be added with this mouth-watering hamper and bring smile on the faces of your dear ones.